Victor Ramdin raised to 1,000 and Marsel Backa called from late position. The button and both of the blinds called as well and the flop brought the K 8 7 . It checked to Ramdin who bet 1,800. Only the big blind made the call and together they saw a turn of 6 . Both players checked and the river brought the 9 . The big blind checked and Ramdin cut out a bet of 6,000. The big blind made the call after some thought, and Ramdin quickly turned over his 10 8 and confidently pulled back his bet. He was correct in assuming that his straight was the best hand, and the rest of the pot soon followed. He now sits with nearly 70,000 in chips. Victor Ramdin raised to 800 from big blind, Marsel Backa raised to 2,400 button and the player in middle position called. Ramdin called and the three saw a flop of J 7 6 . All three players checked and saw the 10 on the turn. Middle position raised to 3,200, Ramdin folded and Backa called. The river was the Q and both players checked. Middle position showed A J and Backa mucked his hand without showing. The hijack raised to 600 and the cutoff and Tom Dobrilovic called before Victor Ramdin made it 3,200 from the big blind. Only the cutoff called and the two saw a flop of 9 5 4 . Ramdin bet 4,000 and the cutoff made the call. Both player checked after the 3 on the turn and again after the 4 on the river. Ramdin showed the A K which was good enough, as the cutoff flashed A-J. Former World Poker Tour champion Victor Ramdin has taken his seat in the field in Flight 1B. Ramdin won the 2006 WPT Foxwoods Poker Championship for $1.33 million. Victor Ramdin raised from under the gun, Brock parker reraised, Brian Meinders four-bet the button, Preston Derden called all in, Ramdin folded and Parker called the raise. The flop came A A 9 , Parker checked, Meinders bet and Parker called. The turn was the 4 , and both players checked. The river was the 4 , Parker bet, Meinders raised and Parker called. Meinders turned over A K for a full house, besting Parker’s K K . Derden threw his Q 9 into the muck and was eliminated in 6th place ($20,886). Brock Parker raised before the flop, Christopher Vitch reraised, Brian Meinders called, Parker four-bet all in, and both players called. The flop came K 9 3 , Vitch checked, Meinders bet, Vitch raised and Meinders called. The turn was the K , Vitch bet, Meinders raised and Vitch called. The river was the 10 , Vitch checked, Meinders bet and Vitch called. Meinders showed 9 9 for a full house, scooping both the main and side pots. 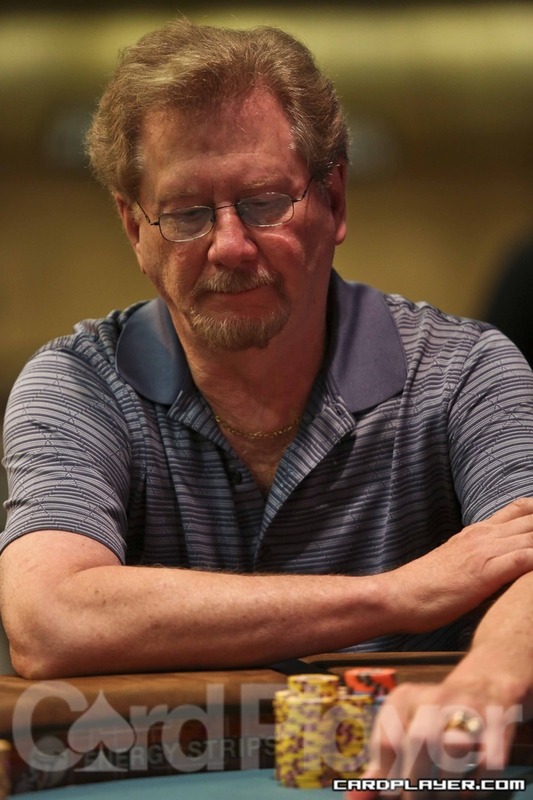 Parker turned over Q 5 and was eliminated in 5th place ($27,986). Voctor Ramdin opened the cutoff for a raise to 24,000, Brian Meinders reraised to 36,000 from the big blind and Ramdin called. The flop came 9 8 5 , Meinders bet 12,000, Ramdin raised to 24,000, Meinders thee-bet to 36,000 and Ramdin called all in. Ramdin was all in for his tournament life with Q J for two over cards and a gunshot straight draw against Meinders’ middle pair with K 8 . The turn and river were the 9 and the 7 , and Victor Ramdin was eliminated in 4th place ($37,897). The remaining three players took a one hour dinner break at the conclusion of Level 6 and will return at approximately 8:45pm local time to resume play. The final ten players all started the day nearly even in chips and without any real deviation from the average stack. Brock Parker took an early lead in the first level of the day after rivering a straight against Preston Derden to jump up to just under 200,000 in chips. Victor Ramdin went the other direction and found himself on the short stack early in the first level. He managed to chip up a bit towards the end of the second level after winning some smaller pots against the other short stacks. Ramdin flopped top pair and rivered a straight to win a pot against Preston Derden although both players ended the level towards bottom of the counts. The final table of Event no. 25 ($1,500 Limit Hold’em Shootout) is now underway, and Card Player will be posting level-by-level updates with all of the action, current chip counts, and prize distributions. The Shootout tournament features a different format than a traditional Hold’em event in that players must win their table before moving on. As players win their individual tables, they take those chips with them to the next round where they must win another table and so on, until the final table is reached. With the elimination of Daniel Walker in 11th Place ($3,088), the final table is now set. Play will begin in Level 8 with blinds of 1,500-3,000 and limits of 3,000-6,000, and will continue until a winner is determined. Jun 12, '11 2011 42nd Annual World Series of Poker $1,500 H.O.R.S.E. NOTE: Play ended last night with 17 players in accordance with the ten-level rule and resumed at 2:30pm. With the elimination of Victor Ramdin in 9th place ($18,577), the official eight-handed final table was set. The final eight players then took a one hour dinner break and returned at approximately 8:00pm to begin the final table. Play began with twenty-eight minutes remaining in Level 24. NOTE: Sixty minute levels with games changing every eight hands. Phil Hellmuth bet 1,300 from the button and the small blind made the call. 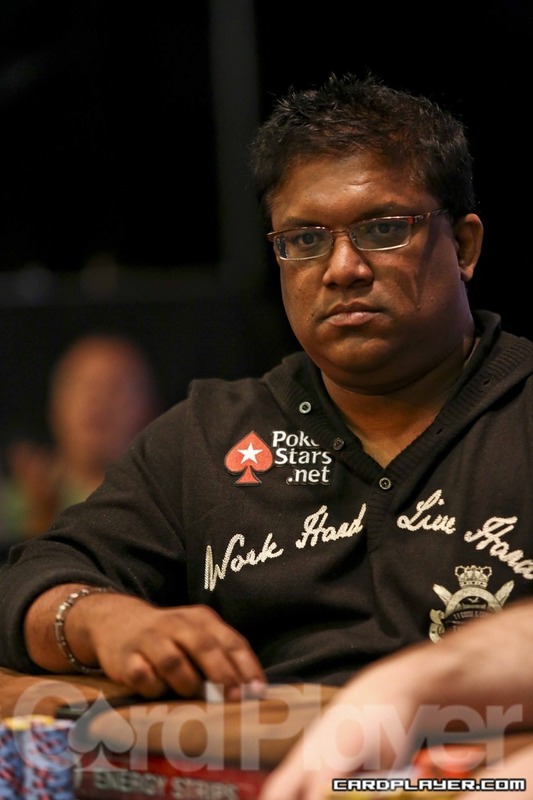 Victor Ramdin also made the call from the big blind and the flop was dealt 7 6 5 . Ramdin grew his stack to more than 40,000 after the hand. NOTE: Day 2 has come to a close and there are 70 players still in the hunt for the top 56 spots that will get paid in The Big Event. Stay tuned for a recap of the day’s events, and tune back in tomorrow at noon PST for day 3 action from Card Player. Ramdin won the hand and he grew his chip lead to 1,050,000 to end the night. Daniel Negreanu raised to 7,700 preflop from the button and the big blind went into the tank before reraising to 18,100. Negreanu made the call and the flop fell A 9 8 . The big blind bet 21,000 and Negreanu made the call. The turn fell Q and Negreanu bet 34,000. The big blind made the call and the river fell 6 . Negreanu bet 75,000 and the big blind went into the tank. He eventually called after several minutes and Negreanu flipped over A Q . 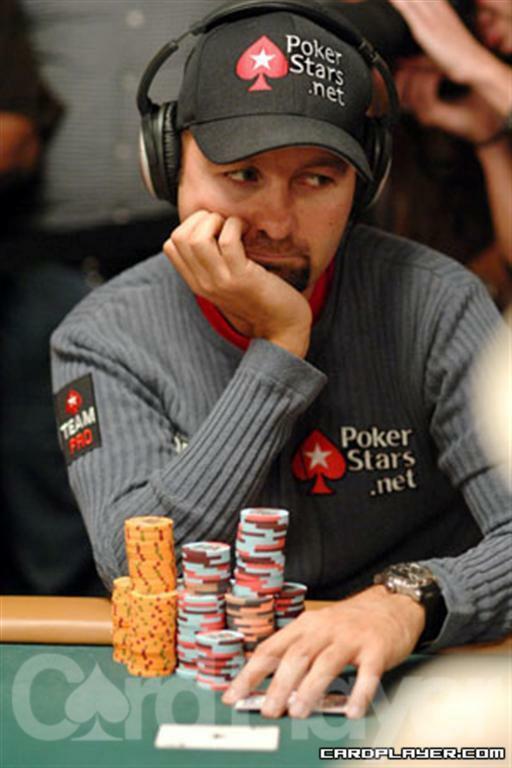 His opponent mucked and Negreanu grew his stack to 260,000 to end the night. Joseph Cheong raised to 2,500 preflop UTG+1 and Daniel Negreanu made the call from late position. The flop fell Q 10 9 and Cheong checked. Negreanu bet 3,200 and Cheong check-called. The 9 fell on the turn and both players checked. The river fell K and Cheong checked again. Negreanu bet 8,500 and Cheong went into the tank. Cheong mucked the Q face up on the table. Negreanu said, “Can we still be friends after this.” He then flipped over the 8 and the 6 as he collected the pot. There was 22,000 in the pot and the flop read Q 5 5 3 when Victor Ramdin bet 8,100 from the small blind. A player in late position raised to 31,100. The hi-jack made the call after spending some time in the tank. He made the call and Ramdin reraised to 80,000. Both of his opponents spent a long time in the tank, but they each decided to fold. Ramdin won the hand and he grew his stack to 255,000 after collecting the pot. Daniel Negreanu got the last of his chips into the middle with A Q in the hole on the hi-jack. His opponent held 9 7 on the big blind. 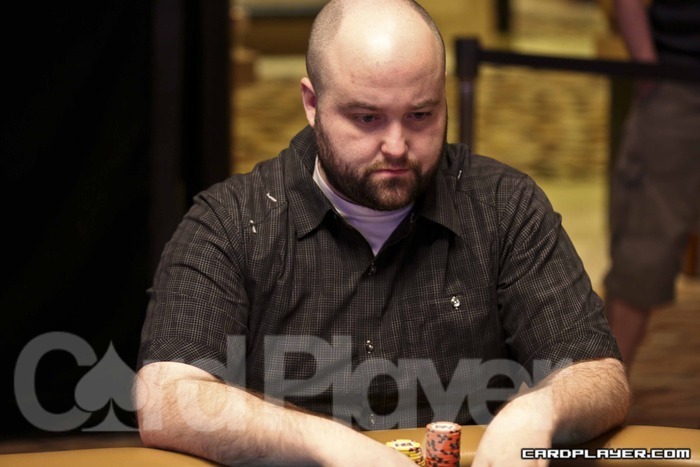 The board ran out Q 10 5 3 4 and Negreanu was eliminated in 37th place and he will take home $9,000 in prize money. The board read A Q 3 2 3 when Victor Ramdin put out a bet for 90,000. His opponent mucked on the button and Ramdin picked up another 120,000 to grow his stack to 1.25 million. The board read A J 9 3 when the button bet 35,000. Chris DeMaci made the call on the big blind and the river fell 3 . Both players checked and DeMaci flipped over A 8 . His opponent mucked and DeMaci grew his stack to 690,000 after the hand. Hachem was eliminated from the tournament in second place and he will take home $300,000 in prize money. Ramdin is the champion of The Big Event and he takes home the top prize worth $500,000. That concludes our live coverage from Los Angeles. Joe Hachem and Victor Ramdin saw another limped and checked pot, this one falling 9 8 6 . Ramdin checked and Hachem bet 200,000. Ramdin check-raised to 550,000 and Hachem made the call. Hachem doubled up and the chip counts are pretty much even at 6 million. Ramdin doubled up on the hand to survive and take the chip lead with 7 million and Hachem fell to 5 million after the hand. Jeremy Ausmus raised to 120,000 preflop and Victor Ramdin made the call. The flop was dealt A J J and both players checked. The turn brought the 4 and Ramdin bet 150,000. Ausmus made the call and the 3 fell on the river. Ramdin bet 350,000 and Ausmus tossed in the chips to call. They revealed their cards and Ausmus held A 9 , but they were no good against the K and 9 that Ramdin revealed. Ramdin won the pot to grow his stack to 3 million and Ausmus dropped slightly but he is still strong with close to 7 million. Brian Leskowitz moved all in on a 9 6 3 flop and Victor Ramdin made the call. Ramdin held 9 8 and he was ahead of the ace-high of Leskowitz until the turn and river brought the A and the 4 . Leskowitz doubled up to 1.5 million after the hand. Ramdin fell to 2.4 million. Nadal was eliminated on the hand in eighth place and he will take home $35,327 in prize money. Ramdin grew his stack to 2.6 million after the hand. Victor Ramdin and Michael Binger got it all in on a 8-5-3 board with two hearts. Binger showed 9 6 for a gutshot straight and flush draw, but he was actually in bad shape against Ramdin’s A 2 . The board bricked for both players and Ramdin doubled up to 47,000. Binger was left with 14,000. There was 15,000 in the pot and a board that read Q 8 2 8 sat on the table when late position bet 12,000. Victor Ramdin made the call from the small blind and the turn fell 7 . Ramdin checked and late position bet 37,200. Ramdin went into the tank for a while and eventually decided to muck. Ramdin was eliminated on the hand in 12th place and he will take home $26,232 in prize money.